CANSEC is North America's largest tri-lateral defence trade show; showcasing leading-edge technology, products and services for land-based, naval, aerospace and joint forces military units. 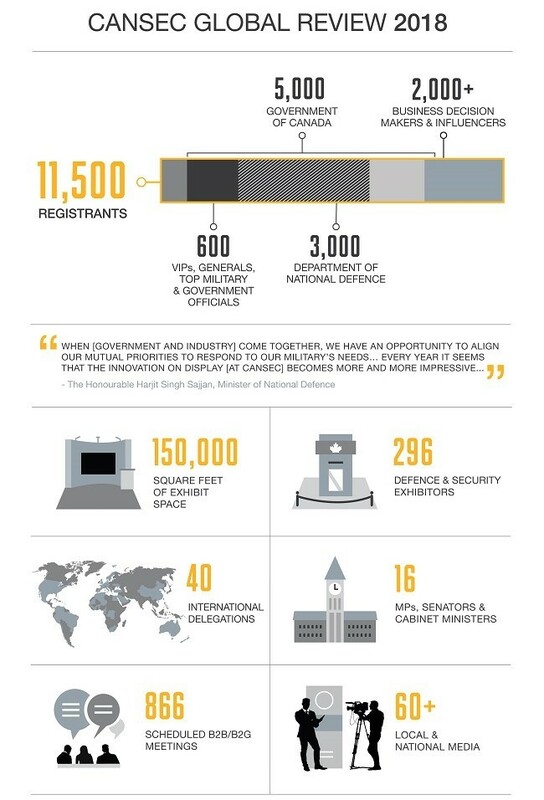 This two-day event, held at the EY Centre in Ottawa, Canada, is the largest and most important defence industry event in Canada. With a captive audience of top level national and international military staff, major procurement officials, and representation from the entire industry supply chain, from large prime contractors to supplying companies, CANSEC is not to be missed! Attendance at all CANSEC events is restricted to CADSI members and government (federal, provincial, municipal, foreign) personnel only. CADSI is offering Transitioning Canadian Armed Forces (CAF) members complimentary entry to CANSEC 2019. This invitation is a part of CADSI’s commitment to facilitate the future career development of members of the Canadian military who have left active service and to help veterans transition into the workplace. At CANSEC, transitioning CAF members will get to build their network as they position themselves for a new career as well as view the latest technologies and trends in the defence industry. They can also purchase tickets to attend the CANSEC Evening Reception held on May 29, 2019 from 17:00 – 19:00. Regsitration will open in early 2018. You must be a transitioning CAF member released or retired from CAF in the past two years. You will be required to show your record-of-service card at the CANSEC Registration Desk upon arrival at the event. If you are a transitioning CAF member at the rank of LCol and above or of a classification of EX-minus 2 and above and released or retired in the last 12 months, you may be unsure if you are subject to any post-employment restrictions. We recommend you contact the Conflicts of Interest section of the Defence Ethics Programme at COIDEP-CIPED@forces.gc.ca or 1-855-447-1112, to ensure that there are no issues with your attendance. In addition, you can refer to the restrictions of the one-year post-employment limitation period under DAOD 7021-2, Post-Employment [http://www.forces.gc.ca/en/about-policies-standards-defence-admin-orders-directives-7000/7021-2.page]. Click the REGISTER NOW button at the top of the page. If you are a Transitioning CAF Member with a profile under the organization name of “Canadian Armed Forces (Ret. )”, enter your Email and Password in the text boxes and click the Login button. If you don’t have a profile, click the Sign up for free button and follow the steps ensuring you use “Canadian Armed Forces (Ret. )” as your organization name. NOTE: Once your profile has been approved, you will receive a confirmation email from CADSI and can proceed to the CADSI login page. NOTE: Some email domains will require a manual approval from CADSI. If you receive an email stating your domain has not been approved, please wait a few days for CADSI’s manual approval to override. Proceed with completing your CANSEC online registration. For further assistance with CANSEC registration, please contact CADSI at 613-235-5337 ext. 45.